Loretta Dullinger, 93, of St. Joseph, died Sunday, Nov. 25 at Quiet Oaks Hospice House, St. Cloud. Her funeral was held Nov. 29 at St. John’s Abbey Catholic Church in Collegeville. The Rev. Ian Donmer, OSB, officiated and burial was in St. John’s Catholic Cemetery in Collegeville. Dullinger was born on May 15, 1925 in Waite Park to Herman and Clara (Baggenstoss) Schleicher. She married Claude Dullinger on Feb. 14, 1942. Dullinger’s faith gave her a sense of strength and comfort. 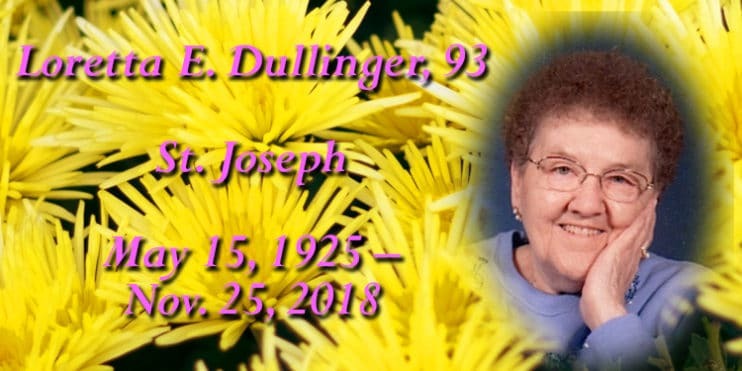 She was a member of the American Legion of St. Joseph and VFW Auxiliary of St. Joseph. She was a 4H leader, a volunteer at church, former owner of Treasure City and she farmed many years with her husband. She had many hobbies some of which were gardening, canning, cooking, sewing, playing cards, but most of all she loved being a grandma. Survivors include the following: her daughter, Carole and (Ralph) Sauer; grandchildren: Joyce (Todd) Brenny, Vern (Julie) Sauer, Ken (Tina) Sauer; great-grandchildren, Holly (Scott) Simon, Alisia (Craig) Soenneker, Nik Sauer and Jessie Sauer; great-great-grandchildren, Bryce, Trentin and Kinley Soenneker and Sutton Simon; sisters: Donna, Janet and Irene and brothers: Harold, Junior and Fred.